Introduced from Old World. 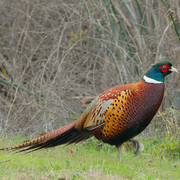 Birds regularly released for hunting may help sustain "wild" populations in some areas. Fairly common in open habitats at low elevations in Kittitas and Kitsap Counties; uncommon to fairly common but very local in similar habitats in King and Island Counties. Found chiefly in grasslands, agricultural fields, shrubby or weedy wastelands, shrub-steppe, semi-rural residential areas, large city parks. 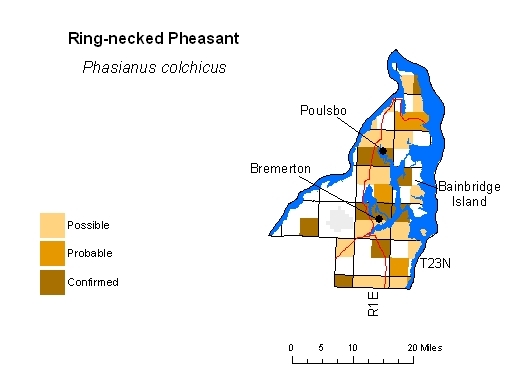 Range as mapped by Washington Gap report (Smith et al. 1997) extends farther north and west in Kittitas County than supported by BBA data.